Israeli artists known and anonymous loom large in S.F. exhibit – J. Nothing is necessarily as it seems: A prism-like fan turns out to be sheets of glass separated by tennis balls. A delicate filigree in the shape of a rhinoceros is, on closer inspection, layers and layers of rusted metal bits. A photo of a woman’s hands resting on a textile belies the fragile negotiations that took place to allow the weavings to be exhibited in the United States. The exhibit by Refusalon is its first in the upscale JW Marriott San Francisco Union Square. Refusalon is a project launched by art dealer and Israeli expat Shmulik Krampf to create contemporary works for public places. Krampf, who arrived in the Bay Area in the mid-1980s, began Refusalon as a yearly event in a Natoma Street warehouse featuring the work of a group of students from the San Francisco Art Institute. As his following grew, the San Francisco resident moved to a capacious space in Dogpatch, developing a reputation as a supporter of artists who craft imagery both powerful and playful using sustainable materials. The current group show at the Marriott encompasses works in glass, metal, paper and recycled objects, such as a sculptured bowl made of seaweed and an antiqued door whose metal protrusions suggest Chinese characters. The artwork fills the hotel’s ground-floor lobby and the light passageways encircling a third-floor restaurant. 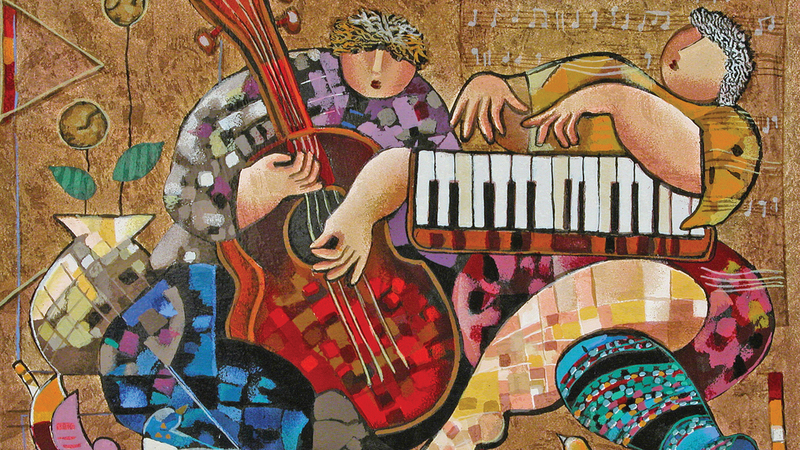 In addition to the 24 artists whose pieces are displayed, the exhibit features an unusual collaboration overseen by Israeli multimedia artist Uri Tzaig, involving 150 Bedouin craftswomen of the Negev village of Lakiya. “Sustainable Art” is the fruit of a 10-year effort. With the help of Hadra Alsanah, a champion of female literacy named one of the world’s 100 most powerful women by the NGO International Alliance for Women, an agreement was reached with the men in the Bedouin community: They would allow the women to take part in this public undertaking if, in a video that was shot to document the project, their faces were obscured. 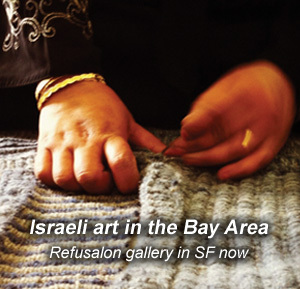 Textiles woven by Bedouin women are featured in Refusalon exhibit. The Israeli Consulate in San Francisco has promoted the Refusalon exhibit on its website, and the Marriott reached out to Krampf to house it. The subsequent agreement allows him to exhibit Refusalon works at any of the company’s hotels. “I would like to hang something from the 22nd floor all the way down,” he said. Tzaig showed his work in the Bay Area some 15 years ago with Homeless, a solo exhibit at the Berkeley Art Museum; an artist residency at the Headlands Center for the Arts in Marin; and several shows with Refusalon. He is head of the Textile Design Department at Shenkar College of Engineering and Design in Ramat Gan, Israel. Krampf, the married father of five, began his career working in film production for CBS News and on several feature films. His credits include “Golda,” a biopic about Golda Meir starring Ingrid Bergman, who he said moved him deeply by persevering with intense concentration while suffering from late-stage lung cancer. The name Refusalon comes from the French Salon des Refusés, which celebrated works rejected by the establishment in the 1860s, including masterworks by Édouard Manet and James McNeill Whistler. Krampf also enjoys a play on words that would have art re-igniting a fuse. This is minimalism with heart and passion. One Refusalon artist, Samuel Yates, incorporated into a piece the cremated ashes of an artist who had tried unsuccessfully all his life to get his art shown. Finally, in death, he became part of an exhibit. “I try to fulfill the artist’s dream,” Krampf said. At the same time, “99 percent of what I do is public relations. I don’t have a choice. But this is part of the creation. Rebecca Rosen Lum is a freelance writer.